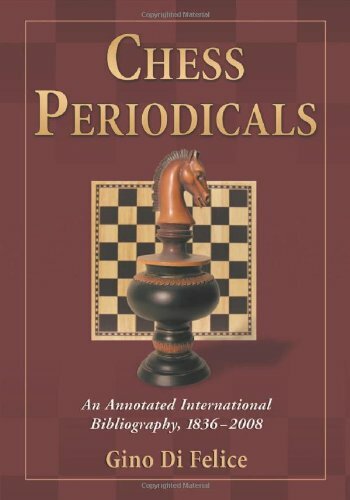 This comprehensive reference work presents detailed bibliographical information about worldwide chess periodicals past to present. It contains 3,163 entries and many cross-references. Information for each entry includes year and country of publication, frequency, sponsors, publisher, editors, subject, language, alternate titles, mergers, continuations, and holdings in chess libraries. Includes an index of periodicals by country and a general index of periodical titles. Gino Di Felice is the author of numerous reference books on chess. He lives in Mosciano Sant'Angelo, Teramo, Italy. ﻿"A ground-breaker. The first volume to deal exclusively with chess periodicals...[a] much-needed work...invaluable...Di Felice has done an outstanding pioneering effort...very impressive...As usual for McFarland the production values for this work are first rate with excellent paper and a sturdy binding that allows the book to stay open at any page despite the size of the volume...recommended"--IM John Donaldson (JeremySilman.com); "remarkable...important"--Huffington Post; "excellent research...fascinating"--Chess Book Reviews.